Our Price £26.10 Another currency? Farming is rapidly changing. Mechanisation and computerisation are just two things which are having a great impact upon the way farms are managed. As new technologies develop and world economies merge; the new global community impacts increasingly upon the farmer. It is still very feasible to operate a successful and profitable farm in technologically advanced countries; but only if the right choices are made, proper planning is practiced and good management is adhered to. 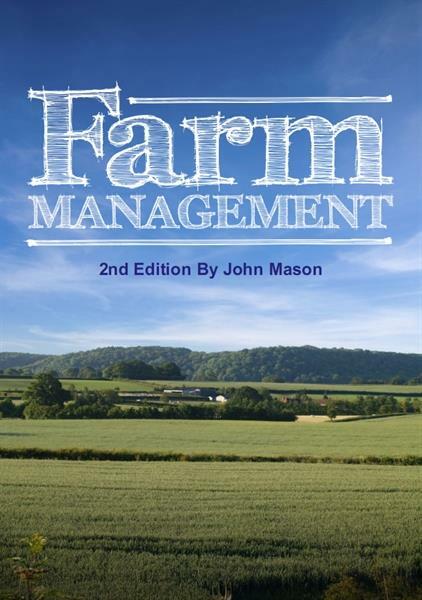 This book is designed to provide an up-to-date, broad and balanced perspective on farm management. managing a farm, small or large. For established farmers it is a useful way to refresh and update trends and techniques. Farming is a dynamic business, don’t let the old cliche of the slow talking man on the land fool you. Those farmers who don’t keep their finger on the economic pulse soon go out of business. In Australia, many soldier settlement farms were established after the world wars. Many soldier settlers have gone on to create viable business enterprises for themselves and their offspring but the majority struggled and eventually opted for a less harsh lifestyle. Improving an existing farm requires assessing the positive and negative aspects of what exists on the property, and weighing up your options for improvement. Are the pastures weary? Do the fences need attention? What about the stock, for example, are these cows second rate milkers because no breeding program has been in place. Obviously the list of questions goes on and on and should continue even when you feel that you have rectified many of the existing problems. There are many forms of share farming arrangements available and they tend to be individually tailored to the situation. Often they will involve a percentage of the profit in lieu of wages for a farm worker, but may also include other factors such as rental or lodgings, or partial wage plus a smaller percentage of profits, etc. The share farmer may have total managerial control of the property albeit with some budgetary considerations in place. If you are a potential share farmer be sure to thoroughly investigate any proposed arrangements you may be contemplating before you sign any binding agreements, in particular ensure that any estimates of future profits are realistic. In addition be sure to put down in the agreement all responsibilities of both parties, including who is responsible for which costs (e.g. rates, services, insurances, cost of materials). Leasing or renting is generally considered a more flexible way of farming than share farming. Farmers can expand or reduce the amount of leased land to match market forces (subject to the availability of land for leasing). It does however have the problem of “insecurity of tenure”. Leasing can allow a farmer with limited capital to start a new enterprise. A major problem with leasing land, particularly for short term periods, is that most farmers will be unwilling to spend much time and effort on maintaining or improving the leased property, unless they absolutely have to (e.g. replace fences that are falling down). This can result in a decrease in the productivity of the leased land, often in a very short time. Some lease agreements stipulate certain activities that must be carried out on the part of the leasee (person who is leasing the property), such as maintaining fences, controlling weeds, and maintaining pasture quality. The location, size and internal characteristics of a farm must be appropriate for the type of farm you are operating. The amount of land required for a successful farm operation depends upon the type of farming to be undertaken and the required size of the enterprise. Farm size can range from a few hectares in the case of intensive fresh herb production, to ten or more hectares for a poultry farm or vineyard, to hundreds, even thousands of hectares for grazing properties. ¦ What is available: restricted by what is available on the market (i.e. if you need 150 hectares; land might only be selling in 100 hectare or 500 hectare lots in your preferred locality). ¦ Amount of land required to produce a reasonable living: this could depend upon whether the farm will be the sole income of the family, or whether you will have off-farm income (e.g. investments, other employment). Sloping sites can be very difficult for stock to traverse, or for you to cultivate. They may require expensive earth works to prepare suitable sites for buildings, and terracing for areas to work on. Sloped sites will generally have good drainage, although steeper slopes that are subjected to heavy rainfall, may result in high surface runoff and erosion. Slopes on unstable soil are also more likely to fail (landslips). For crop production choose sites with maximum sunlight hours and with protection from prevailing winds; for example, in the Southern Hemisphere, North to North - East facing slopes are generally preferred – in the Northern Hemisphere choose a South facing site. Soil characteristics play a major part in the success of both pasture and crop production. Contact the local Department of Agriculture, Land Management or similar body to discuss any potential problems (e.g. salinity, erosion) of targeted properties. applications. It can be quite expensive however to do so when large scale production is planned. Soils that have a high initial fertility will save time and money. In rare cases soils may even have toxic levels of some nutrients that can damage or even kill your plants. Tests should be carried out to determine nutrient levels prior to land purchase to see if they are suitable. ¦Soil structure - well-structured soil will have a crumbly friable structure that is easily cultivated. Well-structured soils have good aeration and good drainage so that plant roots can readily penetrate the soil. Soil structure can be improved by the addition of materials such as lime, gypsum and organic matter - depending on the soil chemical composition. Soils that have good structure to begin with will enable you to commence production earlier and be easier to maintain in good condition. and in turn maximising production. Each type of plant has a preferred pH range. Most will grow quite successfully in the pH range 5.5 to 7.0. Some may prefer slightly more alkaline conditions (above pH 7). When soil pH is not far out of the preferred range, it can be modified fairly easily using acidifying materials such as super phosphate or ammonium sulphate fertilisers to lower pH, or alkalising materials such as lime to raise pH. Soils that have very low or high pH conditions should be avoided. These are often very hard to modify or maintain to a suitable pH range. Soil pH can be easily and quickly measured using a simple test kit or pH meter. Laboratory testing is recommended though for larger sites. ¦Salinity - increasing salinity of both land and water is a problem in many countries. Soils for crop production should have low salinity levels alternatively crops that are tolerant of saline conditions may be necessary. However not many crops are tolerant of very high salinity; these sites are best avoided. ¦Drainage - this includes both infiltration into the soil, and surface runoff (i.e. how much surface runoff occurs and where does it run to?). Speak with neighbours! Consider all parts of the property. Are any areas prone to flooding? If you are interested in this you might also like ACS Distance Education's agriculture courses.